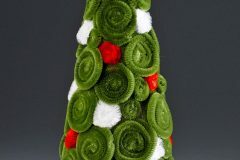 DollarStoreCrafts.com is a daily crafting blog with an emphasis on projects that are cheap, chic, and easy to do. Most of the materials in our projects can be purchased at your local dollar store. Here’s everything you’ve ever wanted to know about Dollar Store Crafts. There’s a lot of info on this page, so here’s a table of contents with links so you can skip to the sections you’re interested in. Dollar Store Crafts is a daily blog devoted to hip crafts using dollar store stuff. 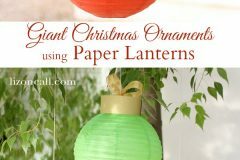 Heather Mann started Dollar Store Crafts in October 2008, and the site has since developed into a successful daily crafting blog with an emphasis on projects that are cheap, chic, and easy to do. 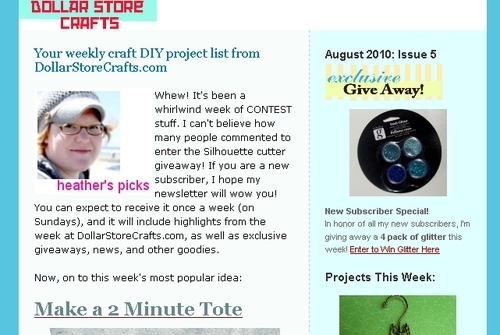 Over 600,000 unique readers visit Dollar Store Crafts each month, and over 1 million pages are viewed each month. Crafts focus on projects that are $10 or less. Emphasis is made on clear, simple directions, and projects that anyone can do! 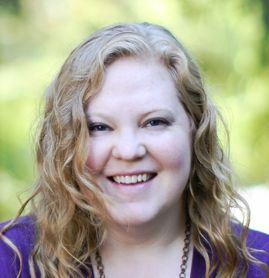 Heather Mann: I’m the founder of Dollar Store Crafts; I’ve been a crafter, writer and entrepreneur since I was a little girl selling polymer clay beads and scrunchies door to door. I’m the co-host of webshow Get a Little Creative, and a mid-century design fan at my home decor blog, Decor Hacks. I live in Oregon, where lots of rainy days make for great crafty afternoons with my three little boys, ages 4, 6, and 7. Things that thrill me: innovative crafts that are clever and simple to make, spending less money, teaching people what I know, making connections with people, collaborating, and using up what I have (stashbusting!). My top three craft tools are: sewing machine, hot glue gun, and googly eyes. I am an expert in frugal crafting, and I love to deconstruct readymade items into new objects. I’ve been blogging since 2000 (I hand-coded my first blog in HTML), and have been writing craft tutorials since 2003. 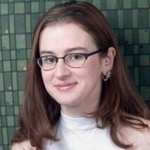 Rhonda Greene is a lifelong resident of West Michigan. She participated in her first craft show at the age of 10, selling jewelry made from found objects. She lives with her husband, Adam, and two cats, Merlin and Abracadabra. Top 3 supplies: Mod Podge, duct tape, and grommets. Read more from Rhonda. Samantha Baldwin is an award-winning journalist with aspirational tastes on a dollar store budget. 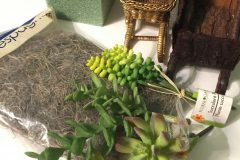 She covers DIY fashion and DIY home design for examiner.com and posts inspiration and tutorials at her personal blog Bromeliad Living. Her favorite craft supplies are thread, hot glue, and anything wrongly discarded by her neighbors. Mike Warren made his own toys as a kid, a few decades later not much has changed. A strong believer in DIY, getting messy and of course the Dollar Store, Mike can be found collecting stuff for his next project around the rainy streets of Vancouver, BC. He has had projects featured on Make, Hack-a-Day, Gizmodo, Betty Crocker, Lifehacker, and Craftzine. Aside from making Man Crafts he also creates wacky things over at Instructables.com. We are four real life sisters who share a love of creativity, clothes, and fabulous finds. We are separated by miles and miles (and maybe a couple of states) We were raised on a meager budget so we learned to make the best of what we had. Thrifting, repurposing and sister swaps helped us make the most of our wardrobes then and we are sticking to it now. We love putting together stylish looks for less and by less we mean less than 5 dollars. 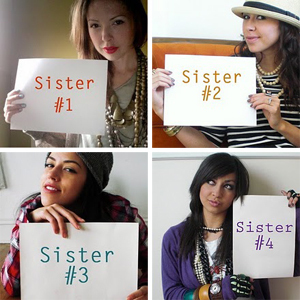 Check out our daily blog: The Sisters 4 Say More is More. This blog is a personal blog written and edited by me. For questions about this blog, please contact Heather Mann (heather at dollarstorecrafts dot com). The owner(s) of this blog would like to disclose the following existing relationships. These are companies, organizations or individuals that may have a significant impact on the content of this blog. We are employed by or consult with: AmazingMoms.com, Kaboose.com, CraftFail.com, MakeandTakes.com, CROQzine.com. Dollar Store Crafts selects certain vendors to be affiliates, and provides links directly to their stores in exchange for a small percentage of the sale, should you choose to buy. We hand-pick companies who we link to because we think their products might be of interest to you, or they sell products that can be used in our dollar store crafts. Our first allegiance is always to you, the reader! This blog is dedicated to bringing you fun ideas. While we would never knowingly promote a project that is flat-out dangerous, some materials and techniques are not appropriate for all ages and stages. Some materials can be toxic (glue, etc.) Please use your own good judgment when taking part in these crafts. We make no claims about the safety of any of the projects featured on our blogs, or the techniques or supplies used. We take no responsibility for what you choose to do with the information and ideas represented on Dollar Store Crafts! Answer: I get inspiration from other blogs, other art and design projects I see around, and of course, the dollar store itself! Also, many of the ideas featured on this blog are from other blogs! Check for links in the stories to visit them. Answer: YES! If you have already made your own dollar store craft, please send me a link to your blog or website (where you originally posted it), OR send me details and a photo, or post on the Facebook page. While I can’t promise all ideas submitted will be featured on the site, I try hard to showcase as many reader submissions as I can! 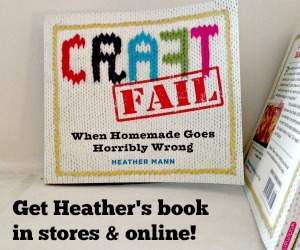 My email address is heather <at> dollarstorecrafts *dot* com. Note about photos: Please don’t send ginormous photos! And, the clearer and prettier the photo is, the more likely I am to use your idea as a feature. Answer: Nope! I (and my contributors) make efforts to credit all the people involved in blog posts. Sometimes DSC will feature a project that strongly resembles others available on the web; chances are, we weren’t aware of yours when we wrote our post. The web is wide, my friends, and lots of ideas have been done before. Sometimes I come up with something all on my own that someone else (usually Martha Stewart!!) has already done. This is part of the mystery of the collective unconscious. But for real, I said I don’t like it when people steal my tutorials, so I don’t do that to others. If something I write strongly resembles yours, let’s just chalk it up to being kindred spirits/of the same mind, okay? ‘Cause I don’t plagiarize. But feel free to write me a friendly comment or email and point out your own awesome tutorial. If you’re nice, I’ll probably link to it. If you’re mean, I probably won’t. I believe the web is at its best when we are kind and friendly and generous. If you’ve posted a tute for free on your blog, then let the tute be free. I’ll set the example and provide all the tutorials I write for Dollar Store Crafts to you for free! Answer: I love making dollar store crafts, and writing this blog, and I want to keep improving this site and the original content I bring you. I can keep bringing you awesome content for free by selling advertising (through my advertising network, BlogHer, and Google ads, or directly to advertisers), or by sharing deals I find on sites like Amazon.com , DollarTree.com or Oriental Trading Company. I am dedicated to bringing you good ideas and helping you SAVE money. I don’t want you to buy anything you wouldn’t otherwise be buying, but if you ARE buying, then you might as well help support your favorite blog, right? Every time you click on an ad or affiliate link, I am able to bring you better content. 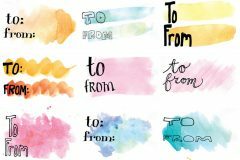 My promise to you is that I LOVE THIS SITE and I LOVE DOLLAR STORE CRAFTING and all I want to do is craft and share my projects for free! Sign up to receive a weekly newsletter update in your mailbox. We’ll recap the week’s hottest posts, plus exclusive content and downloads. We won’t use your info for any other purpose, and it’s easy to unsubscribe if you change your mind. HOW EXCITING!!! I can’t wait to see what you come up with!!! Hey, I love this blog. I’ve tried several of the crafts posted here. I’m not a big fan of the new layout, though; it’s harder to see what’s new. I’m so glad someone thought of this. Its exactly what I need during these tight financial times. You can still have fun, get messy and make memories for a buck! What a great blog! Iam going to re-link your ideas on my blog. Thank you so much for all your great posts. Sweet site! I’m already planning holiday gifts with the awesome crafts you have here. Cheers! 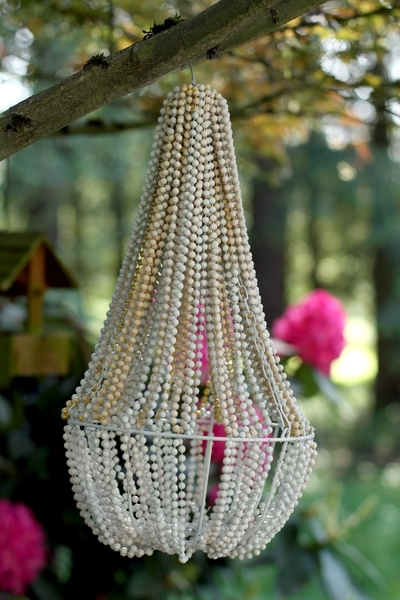 I love finding inexpensive ways to create something useful and beautiful. Great site! What a wonderful site! We love to craft with dollar store items as well (we even have our own category for it!) It is always a great place to start! And everything is at a reasonable price! Although our website is growing, we think the dollar store is one great place! Keep your great ideas coming! An keep up all of your great work! What an awesome blog! I am a Dollar Store Addict and now, you’ve just given me an even better excuse for my addiction! LOL! Thank you for creating this blog! I’ve bookmarked it and I’ll be back! Very cute, interesting and inspiring projects. I just found your site and am looking forward to trying some of these myself! Check out the gingham dish towel that I got for $1 and appliqued. <3 ur blog!!! my bff and i just love your crafts! will be back soon!!! Great site. I’m sure I’ll get lots of new ideas here. I’m always looking for more “green” projects.